The Global Volcanism Program has no activity reports for Muhavura. The Global Volcanism Program has no Weekly Reports available for Muhavura. The Global Volcanism Program has no Bulletin Reports available for Muhavura. Muhavura (or Muhabura) volcano, at the NE end of the Virunga Range, is a relatively youthful stratovolcano with a small 40-m-wide lake in its summit crater. The smaller Gahinga (Mgahinga) volcano, is about 3.5 km E across a broad saddle. The two volcanoes have produced basanitic-to-trachyandesitic lavas. A small parasitic crater has been recently active, but the age of the latest eruption is not known. Rogers N W, James D, Kelley S P, De Mulder M, 1998. The generation of potassic lavas from the eastern Virunga province, Rwanda. J Petr, 39: 1223-1247. The Global Volcanism Program is not aware of any Holocene eruptions from Muhavura. 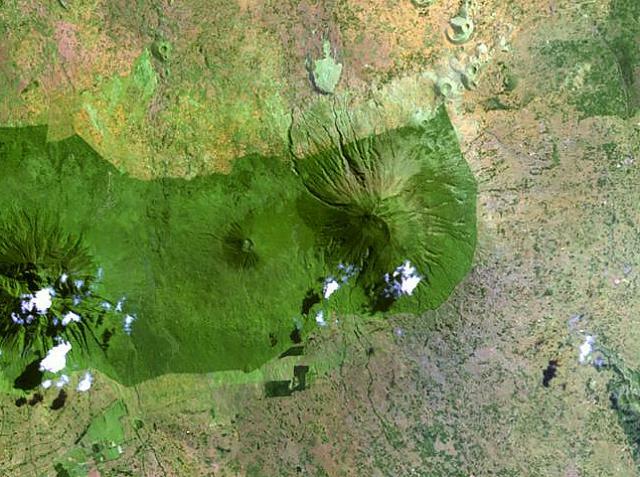 If this volcano has had large eruptions (VEI >= 4) prior to 10,000 years ago, information might be found on the Muhavura page in the LaMEVE (Large Magnitude Explosive Volcanic Eruptions) database, a part of the Volcano Global Risk Identification and Analysis Project (VOGRIPA). There is no Deformation History data available for Muhavura. There is no Emissions History data available for Muhavura. The forested Muhavura volcano (center) rises to 4127 m at the NE end of the Virunga Range. The 3474-m-high Gahinga (Mgahinga) volcano, the smaller cone at left-center, is joined to Muhavura on the west by a broad saddle. The two volcanoes have produced basanitic-to-trachyandesitic lavas. Muhavura is a relatively youthful stratovolcano with a small parasitic crater that has been recently active, but the age of its latest eruption is not known. There are no samples for Muhavura in the Smithsonian's NMNH Department of Mineral Sciences Rock and Ore collection. Large Eruptions of Muhavura Information about large Quaternary eruptions (VEI >= 4) is cataloged in the Large Magnitude Explosive Volcanic Eruptions (LaMEVE) database of the Volcano Global Risk Identification and Analysis Project (VOGRIPA).